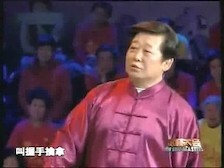 Chen Yu having fun at a show introducing "handshake qin na" to the audience. 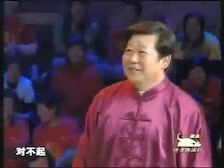 Screenshot from a master class on Chinese TV. As the internet is continuously expanding, at least for those of us who enjoy increasing bandwidths and access, many more moving pictures are available to us than ever before. This, of course, is excellent because it enables us to participate in events across the whole world, be they real or fake, almost in realtime. At the same time, it becomes increasingly time consuming to sift thru the abundance of material available and select what is worthy of our time. In fact, there is a lot of trash out there, from incompetents filming themselves while "sparring" to try to compare two types of martial art (without even getting close enough to be able to touch each other) to self-professed "masters" of fajing who seem to have convinced their disciples to simply run away (I could not believe my eyes!) as soon as their master's belligerent belly budges. Chen Xiaowang accepting a pushing challenge by a strongman competitor. Would the challenger be able to push the grandmaster out of a predefined small ring area, during 3 rounds of 1 minute length each? Screenshots from Hunan TV, a popular Chinese TV channel.